Bengaluru: For all its well-documented troubles, Flipkart Ltd remains India’s outstanding Internet company. A Mint analysis of the financial statements of the country’s top 41 consumer Internet start-ups and companies highlights why Flipkart continues to be the torch-bearer of India’s start-up ecosystem. The analysis also makes for a worrying read for start-up investors or anyone optimistic about the state of the consumer Internet business. Flipkart accounted for 75% of the revenues but only 46% of the losses at these companies for the year ended March 2016, the latest for which numbers are available. The online retailer, which was valued at $15 billion in its last funding round in the middle of 2015, also accounted for nearly 40% of the valuation of the companies. None of the 41 start-ups is an early stage company; all have raised at least two rounds of funds from institutional investors, or Series B rounds as they are called in start-up jargon. More than half of these start-ups have raised many more rounds of funds. The numbers exclude those at ANI Technologies Pvt. Ltd that runs cab hailing service Ola, which hasn’t yet reported its results for the financial year 2016. In the previous year, Ola had reported a loss of Rs755 crore on sales of Rs418 crore. The analysis reveals why funding has slowed considerably for Internet start-ups over the past 15 months. There’s an unmistakable mismatch in the valuations and revenues of Internet companies. On a cumulative basis, the revenue-to-valuation multiple of these 41 start-ups was 11 times, which for older start-ups (especially inventory-based start-ups) is a relatively high ratio. The loss numbers are shocking. The companies together reported losses of nearly Rs16,000 crore to generate revenues of roughly Rs24,000 crore in the given period. Only one company, Bigtree Entertainment Pvt. Ltd, which runs ticket seller BookMyShow, showed a profit. If Flipkart were to be removed from this list, the multiples would get considerably worse. Not that Flipkart numbers are flattering by themselves. The company’s various entities, which include its logistics unit as well as fashion retailer Myntra, reported a net loss of roughly Rs5,770 crore on revenues of nearly Rs18,000 crore. To be sure, Internet businesses prefer to be valued on gross merchandise value (GMV), or the value of goods sold on the platform, rather than on revenues. Many of the start-ups in the list are set up as marketplaces, which take a cut on every transaction rather than sell goods directly to customers. Still, revenue is a more reliable number than GMV. 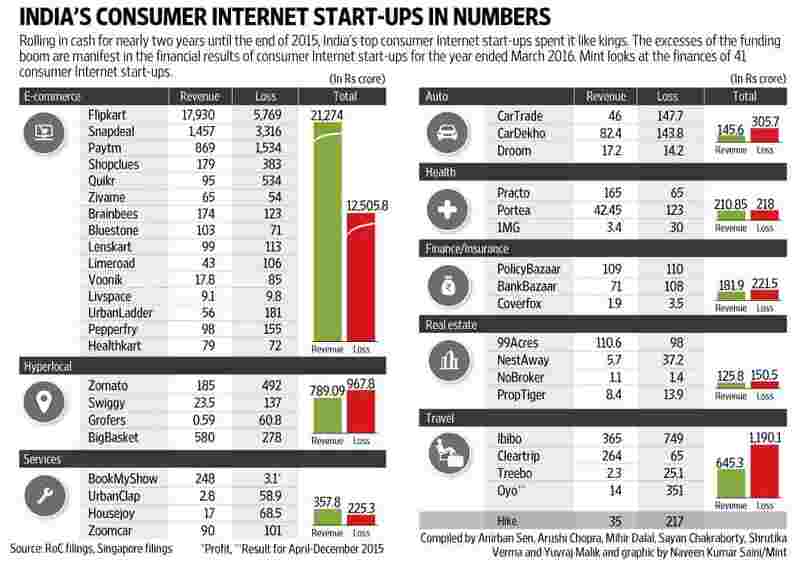 And, most of the 41 start-ups including Flipkart, Snapdeal (run by Jasper Infotech Pvt. Ltd, Zomato Media Pvt. Ltd, Grofers India Pvt. Ltd and hotel aggregator Oyo (Oravel Stays Pvt. Ltd) have cut monthly losses since the beginning of 2016. These companies have become leaner, slashed spending on discounts and advertising, avoided thoughtless expansion and generally tried to find less unsustainable business models. But given that the e-commerce market showed little growth in calendar 2016, the numbers reinforce the precarious state of India’s Internet start-ups and their venture capital (VC) backers. The unforeseen weakness in the consumer Internet means the revenue-to-valuation multiples are bound to look even more unsustainable as valuations are based partly on growth projections, which have taken a big hit. Down-rounds and distress sales and look inevitable. Flipkart’s co-founders Sachin Bansal (in January 2016) and Binny Bansal (January this year) have both lost their CEO position in the past 13 months; Snapdeal is a shell of the company it once was; and Ola is facing a so-called down-round. VC firms have largely avoided punishment. 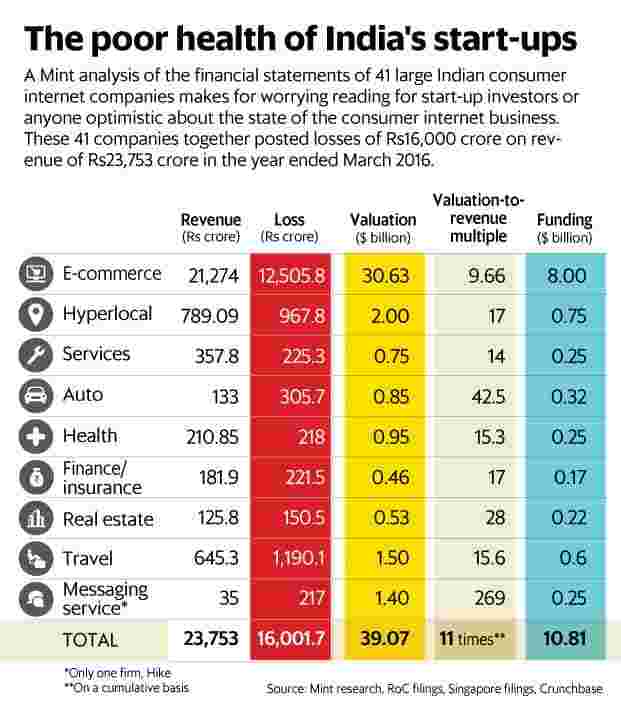 No wonder then that some of the best-known entrepreneurs and VCs are calling for government protection from the companies (Amazon and Uber) that can still afford to operate in the freewheeling way Indian start-ups did in the go-go years of 2014 and 2015.